TEGUCIGALPA, Aug 4 2018 (IPS) - A series of laws that came into force in the last five years and the petition for amparo by 35 journalists and 22 social communicators against the government’s “Secrecy Law” give an idea of the atmosphere in Honduras with regard to freedom of expression. The international organisation Reporters Without Borders (RWB) gives an account of the situation in its annual report this year pointing out that free speech in the country is at “high risk”. Freedom of expression has suffered a “slow decline” in the last decade, says RWB, which underscores the levels of impunity, corruption and organised crime in the country, as well as the intimidation and threats suffered by journalists working for “opposition or community media outlets,” who are attacked and even forced to leave the country. From 2001 to 2018, some 75 journalists and social communicators have been murdered in Honduras, and of those crimes only six have been prosecuted while the rest remain unpunished, according to the state Honduran National Human Rights Commission (Conadeh). In its 2018 report, RWB says that Honduras ranked 141st out of 180 countries assessed. Víctor Hugo Álvarez, a journalist and social analyst, said freedom of expression is jeopardised by corruption and drug trafficking. “Drug-trafficking groups are in collusion with corporate powers and political and police authorities which prevents a healthy climate for working in journalism, thus putting media workers at great risk,” he told IPS. Added to all this is “corruption, which also taints the exercise of the profession,” he added. “There is a kind of complicity between the media and the government defined by the advertising guidelines and the blocking of media coverage of certain information. Advertising is, for now, the best deterrent by the government in its control over a sector of the big media,” this reporter with more than two decades of experience told IPS. But it is the latest legislation, he says, that is hampering the exercise of freedom of expression and journalistic work in the coverage of pernicious phenomena such as corruption. One example is the Law for the Classification of Public Documents Related to National Security and Defence, popularly known as the “Secrecy Law”. “This law violates access to real knowledge of how public funds are managed, there are budgets that people don’t know about, and if this mechanism is not repealed or reformed, there will be no fluid and liberating information, today secrecy seems to be the norm,” he said. In force since 2014, the 17-article Secrecy Law creates categories and secrecy timeframes ranging from Restricted Information (five years), Confidential Information (10 years), Secret Information (15 years) and Top Secret Information (25 years). This law falls under the National Council for Defence and Security, and although it lacks regulation, in its first resolution the National Council assigned the secrecy status to information held by at least 21 governmental and state institutions. 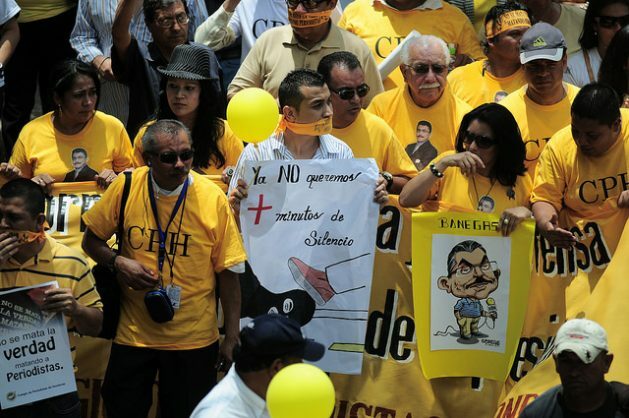 Among these institutions are some that are under investigation by the State Prosecutor’s Office and the Mission to Support the Fight against Corruption and Impunity in Honduras (MACCIH). MACCIH, created by the Organisation of American States (OAS), has been working in the country for two years to strengthen institutions and help dismantle large networks of corruption. It emerged in response to mass demonstrations against corruption and impunity, especially the embezzlement of the social security system to finance political campaigns and other irregularities by the ruling El Nacional party. The embezzlement is estimated at 46 million dollars. Information from the Honduran Social Security Institute was declared secret by the National Council on Defense and Security, which falls under the office of the president. Civil society organisations that fight corruption and advocate freedom of expression such as the Committee for Free Expression (C-Libre) say the Secrecy Law violates freedom of expression and the right to information. This is because one of its articles states that if secret information comes into their possession, the State intelligence agencies must be notified so that its classification is respected. It also limits the law on transparency and access to public information since this law does not allow public information to be classified. But there are other legal reforms adopted that have raised the alarm among human rights and freedom of expression organisations. These are a series of articles in the new penal code that will enter into force in 2019 and are related to the criminalisation of social protest, contempt of court, terrorism and the current debate on a cybersecurity law to regulate social networks and the Internet. In 2015, the government approved a Law on the Protection of Journalists, Social Communicators, Human Rights Defenders and Judicial Officials, implemented by the Secretariat of Human Rights. The law has a Protection Mechanism aimed to assist victims. More than 198 people have used the mechanism in the last two years. Human rights defenders, and especially environmentalists and journalists, are the majority of those who have taken refuge under the Protection Mechanism. In May of this year, the Public Prosecutor’s Office created a Special Prosecutor’s Office for Human Rights Defenders, Journalists, Social Communicators and Justice Officials to prioritise their cases and unpunished crimes. “This only shows that the climate of freedom of expression is one of high risk and it should be noted that here political intolerance of criticism of the three branches of government has prompted them not to investigate threats to the press and to register the crimes without putting a face or name to the culprits,” warned Velásquez. The government of President Juan Orlando Hernandez, re-elected in November 2017 during a wave ofsocial unrest that unleashed a new and still unresolved political crisis, has been the main driver of measures and reforms that undermine freedom of expression and access to information since 2014, in this country of 9.2 million people, considered to be one of the three most unequal countries in the world, after South Africa and Haiti.